As the third book I’ve read and reviewed in Ms. Parker’s Tallenmere series, I was chomping at the bit to get started with this one. I love, love, loved the first two installments and couldn’t wait to immerse myself once again in her world. Although not my fave in the series, this book was still wonderful. The story starts off about ten years before events in Serenya’s Song (reading the first two books is not a prerequisite, each stands alone quite well) and introduces us to Loralee, who is being exiled on a mysterious island. Why she’s been banished here is somewhat of a mystery, one that we’ll spend the next 3/4 of the book discovering. Then we rocket forward to present day, where we meet up with Sir Igrorio “Robert” Everlyn and his paladin comrade / brother Francis. When their ship is besieged by a storm and lost to the waves, Robert washes ashore at the cusp of death… only to be rescued and revived by his long-lost love Loralee, whom he had been led to believe was dead. I didn’t realize when I started this book that I’d signed up for time travel, but Ms. Parker takes us on a wild journey back in time 65 years to Sir Robert’s tragic childhood and events leading to his meeting the young temple priestess and healer, Loralee. A good 75% or more of the story is spent spanning various time periods of their younger lives which, despite their obvious love for one another, are spent apart. It was agonizing to watch and wait for these two to come together again. When we finally returned to the present day, I couldn’t figure out how on earth things could be wrapped up and resolved with such a small portion of the book remaining. Yet Ms. Parker pulled it off with aplomb! If you’re looking for a steamy romance, this one doesn’t pack the same punch as its predecessors. But if stalwart devotion, heartbreak, angst and adventure are what you seek you’ll not be disappointed. And in case you missed it in the book blurb: there’s DRAGONS! You can never go wrong, in my book, if you’ve got dragons. 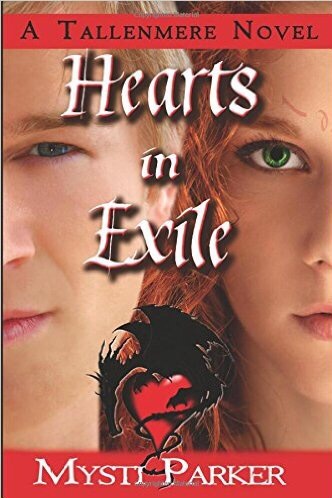 Pick up your copy of Hearts in Exile HERE, and check out the rest of the Tallenmere stories while you’re at it.